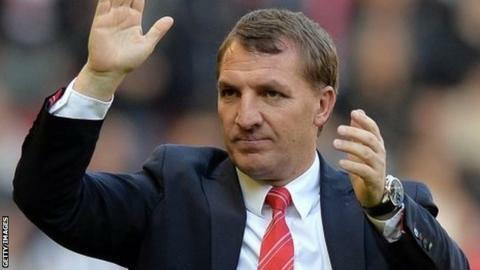 Liverpool boss Brendan Rodgers has been named the League Managers' Association manager of the year. The 41-year-old guided the Reds to second place in the Premier League, as well as a return to the Champions League, as they finished just two points behind Manchester City. "I was hoping I'd be on the open top bus tonight," said Rodgers. Crystal Palace boss Tony Pulis was named Premier League manager of the year. Pulis led the Eagles to a comfortable 11th-place finish, having been six points from safety when he took charge towards the end of November. Rodgers, meanwhile, is the first Liverpool boss to win the award in its 20-year history. Under the former Swansea manager, the Reds had been strong contenders for their first top-flight title since 1990. They had been five points clear at the summit when they hosted Chelsea on 27 April, but a 2-0 defeat disrupted their momentum, as City won all their remaining games to finish top of the league. In Rodgers's first season in charge, Liverpool finished seventh with 61 points, winning 16 league matches, losing nine and scoring 71 goals. This season they have finished second, with 23 points more, winning 26 matches, losing six and scoring 101 goals. However, Liverpool's 84-point haul was 23 more than they managed in 2012-13, while a run of 11 successive league victories was their best in 24 years. LMA chairman Howard Wilkinson said: "There can be no greater tribute to a manager and his work than a tribute awarded by his match day foes and peers. "For Liverpool and Brendan, I'm sure we all hope this season marks the beginning of a new voyage and a new era." Leicester manager Nigel Pearson won the Sky Bet Football League Championship manager of the year award, having led his side to next season's Premier League with 102 points as they finished top of the second tier. Kenny Jackett, who steered Wolves to the League One title, shared the division's award with Leyton Orient's Russell Slade, while Scunthorpe's Russ Wilcox was League Two manager of the year. Wilcox guided Scunthorpe to promotion and broke a 125-year-old Football League record for the longest undefeated run for a new manager - the Iron went 28 games without losing after his appointment. Sheffield United's Nigel Clough was named the FA Cup manager of the year after taking the League One side past Premier League Aston Villa and Fulham en route to the semi-finals. The LMA manager of the year is voted for by all 92 bosses in the Premier League and Football League.